Some would say I started my fabulous career in math class, at times being reminded by the teacher that applying make up on myself and the girls was best suited for after school. I have a natural calling to the health and wellness side of the beauty industry. I began in 1998 by furthering my education at Northeastern Oklahoma studying health and wellness. I excelled, and excited for more knowledge of my skill I attended White River School 2002. I was fortunate to apply myself at the Oasis, a spa with high end product and treatments. Gaining my experience in the massage industry; in 2004 I attended Vatterot College to catapult my profession as a skin care specialist. I improved my practice by working at Matlock Dermatology Clinic in 2005. 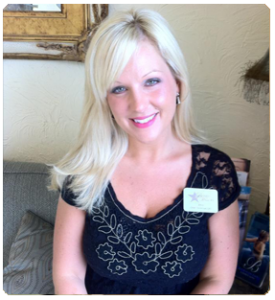 Becoming a knowledgeable esthetician and proven record of success I believed in myself and moved to Destin. I had the greatest fortune working beside Betsy Beebe at the Beverly Hills Day Spa. Surrounding myself with intelligent hard working people I had the best opportunity to buy the business in 2007. Ever since I have dedicated life to helping many people improve their sparkle. I thrive on bringing out the best of everyone’s inner beauty, meeting life long clients and friends along the way. Ever more important to stay modern with the current trends and break through techniques in the demanding field of skin care & massage therapy. Anyone who works with me has the same values and passion in taking care of others – we all feel rewarded are immensely satisfied when our customers leave feeling refreshed and rejuvenated. In a world of hustle and stress I want to provide an environment that is relaxing and beneficial. It is important to me that everyone receives a first class experience. Whether it be a party or a one on one treatment with myself or my talented staff, you will feel like a star!